Nick Calathes once more flirted with the triple-double and Panathinaikos stayed alive. It can’t get better for FC Bayern Munich. After 21 rounds, not only they won probably the best game so far of the Turkish Airlines EuroLeague regular season but their victim was Fenerbahce and they are seventh in the league standings. 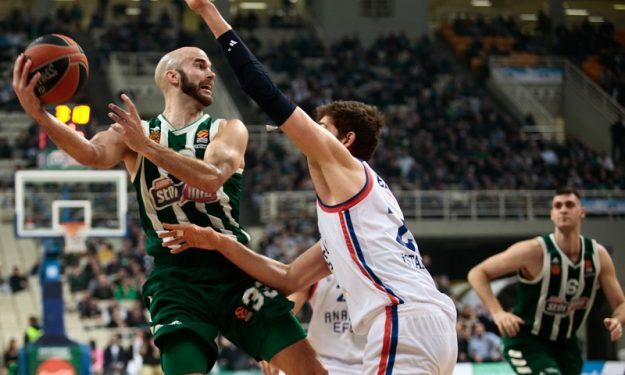 And while there were interesting side stories this week, with Darussafaka Tekfen almost pulling an upset against Real Madrid and FC Barcelona dominating Olympiacos in Piraeus, nobody could steal the show on a personal level from Nick Calathes. In a do or die game for Panathinaikos, Calathes had a game for the ages, getting near a triple-double once more. He finished the night with 20 points, 13 assists, and eight rebounds as Panathinaikos OPAP prevailed over Anadolu Efes and remains part of the playoffs race. It will not be easy for the Greens, but they lived to fight another day. Meanwhile, without Luka Doncic in the Turkish Airlines EuroLeague anymore, Calathes remains the main candidate to register a triple-double after Nikola Vujcic. Nick Calathes: He finished the night with a 35 PIR and a big win. Nando De Colo: By the numbers, he is the MVP of the round with a total of 26 points, seven rebounds and seven assists that has, as a result, a 38 PIR in CSKA Moscow‘s win over Buducnost VOLI. Derrick Williams: His all-around performance (19 p., 5 r. 2 bl.) on both ends of the floor was once again the motor behind FC Bayern Munich’s win over Fenerbahce BEKO. Johannes Voightmann: In the crucial game against Maccabi FOX Tel Aviv he made things happen for KIROLBET Baskonia with 20 points, missing just one shot (4/4 2p., 4/5 3p.). Jordan Mickey: With Khimki Moscow Region trying to stay alive in the playoffs race, he led the charge against Zalgiris Kaunas with 20 points (8/14 FG), nine rebounds and two blocks. As he said after the game against Olympiacos Piraeus: “We kept them at 55, what else can I say?”. Coach Pesic has been criticized heavily, but FC Barcelona Lassa had an impeccable defensive performance on the road and also got the tie-breaker against the Greeks. As he stated, what else can we say? AX Armani Olimpia Milano beat Gran Canaria but also Arturas Gudaitis was hurt. Milan may lose their starting center, fellow big man Kaleb Tarczewski is injured and just days after adding James Nunnally to their roster, the Italians might be back on the market.